Our magazine well for small-frame Glock pistols is not a flimsy piece of plastic prone to cracking but rather CNC machined 6061 lightweight aluminum finished and anodized in matte black to match the gun. It will not interfere with stock base pads and is compatible with just about any aftermarket base pads. This is a drop-on part that requires no modifications to the frame and is a must for the fast reload. 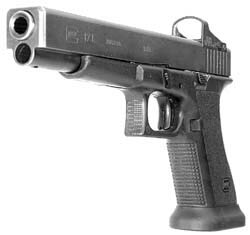 DISCLAIMER: "GLOCK" is a federally registered trademark of Glock, Inc, and is one of many trademarks owned by Glock, Inc. or Glock Ges.mbH. Neither JP Enterprises, Inc. nor this site are affiliated in any manner with, or otherwise endorsed by, Glock, Inc. or Glock Ges.mbH. The use of "Glock" on this package is merely to advertise the sale of Glock pistols, parts, or components. For genuine Glock, Inc. and Glock Ges.mbH products and parts visit www.glock.com.